Even before the MBA programme officially started it’s already become clear how much of an exciting international experience it is going to be! The incoming MBA students joined up to attend a two-day trek to Singapore to learn more about the region, selected companies and what it’s like to do business in one of the most dynamic places in the world. Coming from Germany, this was a fantastic opportunity for me to revisit Singapore where I previously spent an exchange year at the National University of Singapore back in 2006/2007. The trek kicked off last Wednesday evening when around 20 of the incoming MBA students (plus a few almost-graduated students from last year’s MBA class) met for the first time in a Singapore hotel room. Unlike the room’s temperature which was ice-cold (which seems to be a general phenomenon in Singapore’s tropical climate) the first get-together was extremely welcoming and very exciting as our group comprised of students from a broad range of industries (consumer goods, finance, real estate, electronics, law, construction, academia, energy etc) and nationalities (Singapore, Malaysia, Indonesia, Philippines, South Korea, UK, US, India, China, Guinea, Greece, Germany). Talking to my future class mates and learning more about their backgrounds and future plans was extremely inspiring and really held up the “Cambridge experience” as truly international and diversified. The programme started on Wednesday evening with a talk by a Canadian-Singaporean HR advisor on how to look out for job opportunities in general and what to note in a Singaporean context especially. On the next morning we all gathered in the hotel lobby and boarded the coach to our first destination – Singapore’s OCBC bank. We were greeted by a member from HR and two employees from OCBC’s investment banking and treasury divisions. With their 18-month Management Associate Programme targeted at MBAs and a great emphasis on providing learning and development opportunities to their employees, this was a great experience for me to learn more about an Asian bank and its activities in the region which I was previously not very familiar with. Our next stop was Deutsche Bank’s in-house consulting department. Being quite familiar with Deutsche Bank in general it was highly interesting to meet their in-house consulting team based in Singapore. Three in-house consultants, two of which who had previously worked in Deutsche’s Frankfurt office, gave us an overview of how Deutsche has set up its in-house consulting department and which kinds of projects they manage from Singapore for the entire region of South-East Asia. After lunch at Deutsche out last stop of the day was Mapletree, a Singaporean real estate development and investment company with activities all across South-East Asia as well as in the US, UK and Australia. A presentation was given to us by one of their Asset Managers who had recently joined Mapletree to identify new real estate opportunities in the Philippines. For the evening Conrad Chua (Head of Cambridge MBA Admissions and Careers and also Singaporean) had organised a talk by the founder and managing director of Novo Tellus Capital Partners, a Private Equity firm based in Singapore. He shared with us how he set up his own PE firm after a career as a management consultant, banker and former MBA student. Day two was to be even more intense as four companies were on the agenda. Unilever was the first on the list. The coach took us to Unilever’s large training campus “Four Acres” -located outside of Singapore’s busy downtown district. To everybody’s delight we were invited to take some Unilever products with us into the meeting room. 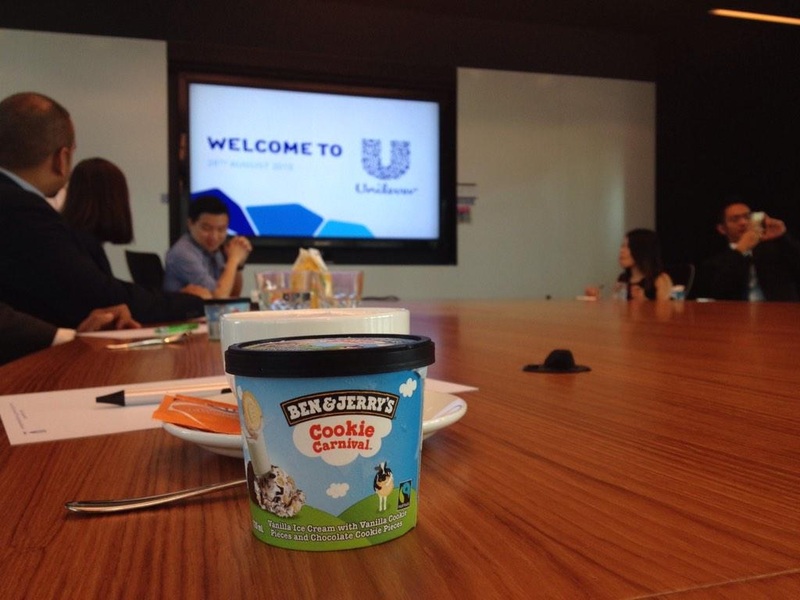 Many of us thus listened to their corporate story and the structure of the Unilever Future Leadership Programme while enjoying a Ben & Jerry’s ice cream. Afterwards we headed back downtown to meet the management consultancy A.T. Kearney. I was particularly impressed by the way they positioned themselves with regards to the larger consulting firms by placing great emphasis on personal relationships within the company. This was underlined by the rather informal character of the visit and their very approachable consultants of whom we met quite a few over lunch. Next up was one which many of us had been looking forward to – Google’s Singapore office. As to be expected the office was unlike any of the ones previously visited, stretching over four floors of a downtown office building and being very googely indeed. A sleeping room, a cinema and massage chairs in the office seem to be only some of the benefits Google’s employees get to enjoy. How to become one, given the vast numbers of applications they receive world-wide, was something we were guided on by several of their HR managers. Finally the last stop after a long day was Gallup, a polling and management consulting firm. In a very passionate presentation, one of Gallup’s managers told us the story of Gallup from a political polling company to a global research-based consulting firm with a particular emphasis on personal coaching. Being back in Germany, thinking about the past week, it really is amazing what one can experience in just a short time. This trek has not only been extremely rich in terms of international exposure and intercultural encounters in a South-East Asian context but also made me think deeper about Europe. As one of A.T. Kearney’s consultants who had worked for the firm in London and Brussels before coming to Singapore put it, “in Europe it is mainly about restructuring and cost-cutting projects, in South-East Asia it’s about growth”.